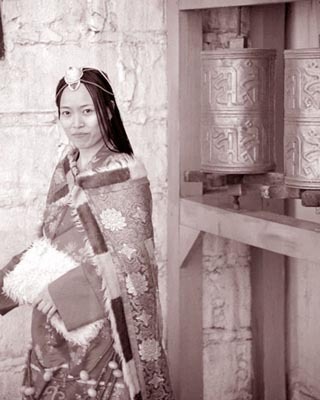 China's history spans back as far as 6000 years ago. 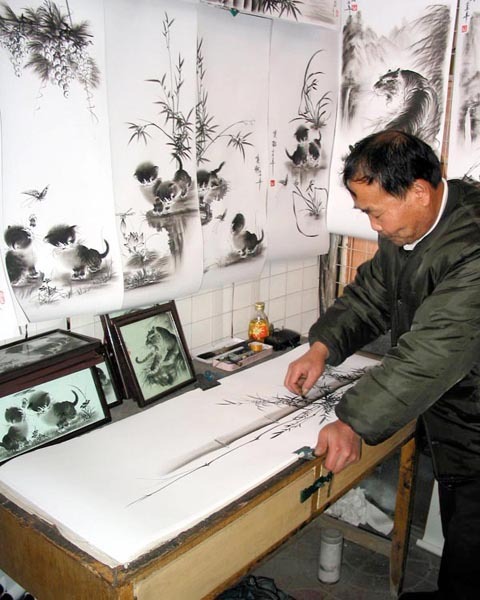 The tradition of art in China is probably as old, although few examples past 3000 years have survived the test of time. China is a big place, in fact it's just a little larger than the 50 states. Traveling from North to South in China, it feels like you've traveled through several countries. 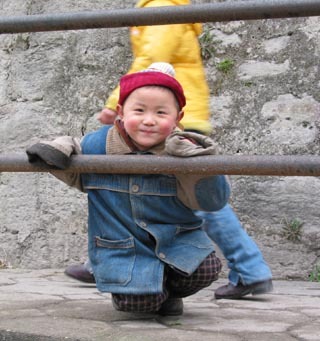 There are hundreds of dialects, accents, and languages in China. 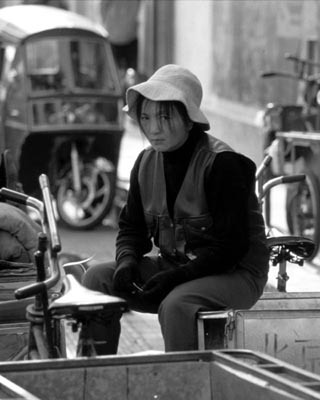 If you speak "Beijing Mandarin", by the time you have reached the middle of China, it becomes difficult to understand the local people, because the accent or dialect is so different (similar to a strong-accented Scottish person and New Yorker trying to communicate with each other). 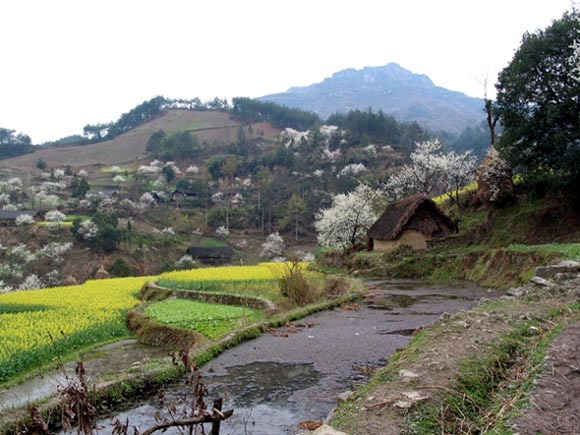 When you reach southern China, most communities speak a completely different Chinese language (Cantonese, and other variations). The same is true if you find yourself in places like Shanghai or Tibet where people speak the local language which can not be understood by Mandarin-Chinese speakers. 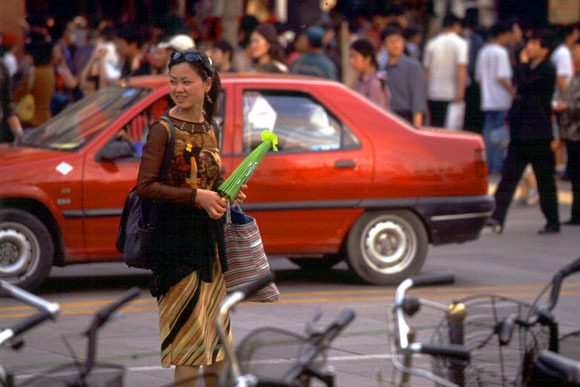 China is full of local languages, but that is not all. 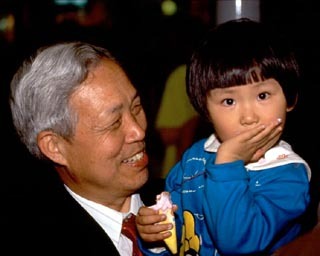 There are also 56 native ethnicities and nationalities around China. 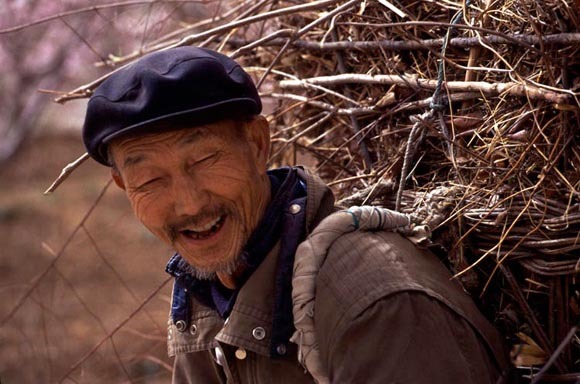 The most common nationality (typical Chinese person) is the "Han" nationality, but other common ones include Manchurian, Tibetan, Uygur, Miao, Zhuang, and Mongolian. With all of this diversity in the people and language of China, you can imagine how Chinese art follows many paths also. If you want landscapes of the Great Wall, an artist from Northern China who grew up in the shadow of the Wall is probably the best choice. If you want a portrait of bamboo, perhaps an artist from the South who grew up in a house made from bamboo would be the way to go. 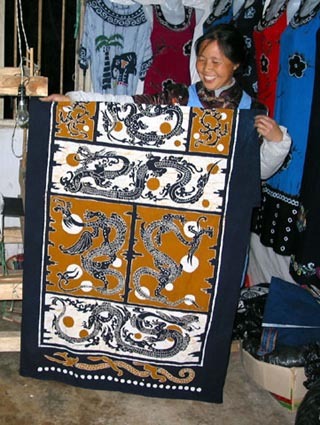 If you want a nice batik cloth, you should go to the legendary birthplace of batik art in a small stone village near Anshun in the Guizhou province. If you want poetry or paintings of horses, Xi'an is a great place since it was the capital of the Tang Dynasty which is famous for spawning some of the most famous poets and poetry in China and for the emperor's love of horses and use of horses in war, fox-hunting, and recreation. If you want sophisticated and well-rounded art from some of the most educated people in China, Beijing (the place I call home in China) is a good place to start. 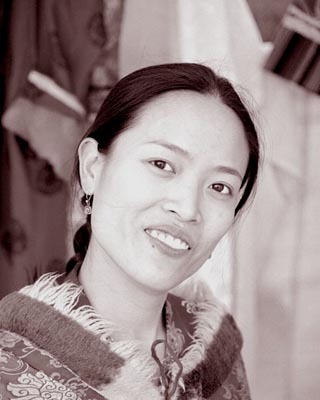 Since China's art culture is so diverse in both style and geography, I travel all over China collecting art for you. This is a challenging job. In one typical example, I travel for days on a train, and up to 18-hours on a bus, then hike 2 days to a remote mountain village only to find that the artist I am seeking has left to be with his family in another province for the winter. Sometimes I travel with no plan at all, and simply buy a ticket on the next departing overnight train to some town that I have never visited. Once I arrive, I ask around and try to find some local artists or see if the town has a small art market where artists gather on the weekends to sell their wares. Strangely, this is actually a more successful way to find interesting art than seeking out a specific artist, or type of art. 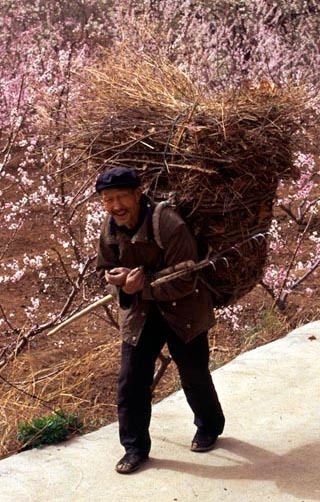 Minority people have been carrying their children on their back for generations. A batik artist from my visit to the legendary "Stone Village"
Old Mr. Wang a former peasant farmer with a secret talent for charcoal art that he kept hidden during the Cultural Revolution. 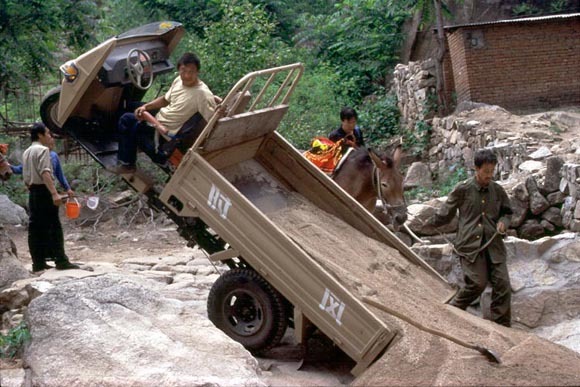 Using the new "easy dump" feature of his 3 wheel truck, Li Ping quickly empties the extra sand that previously overloaded his vehicle. (Note that virtually nobody takes notice of the man suspended in an eternal wheelie. Apparently this must happen all the time). 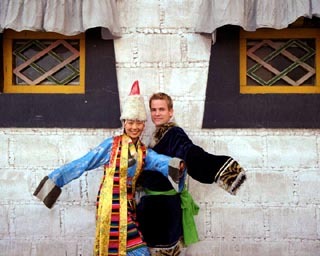 If you have the means, I suggest borrowing some clothes and dancing with the natives near a Tibetan Temple. As proud as a grandfather can be. All of these photos were taken by me on my travels around China. Please be kind enough to let me know if you intend to steal them. I will be happy to provide you with full size versions to help your theft be more worthwhile.